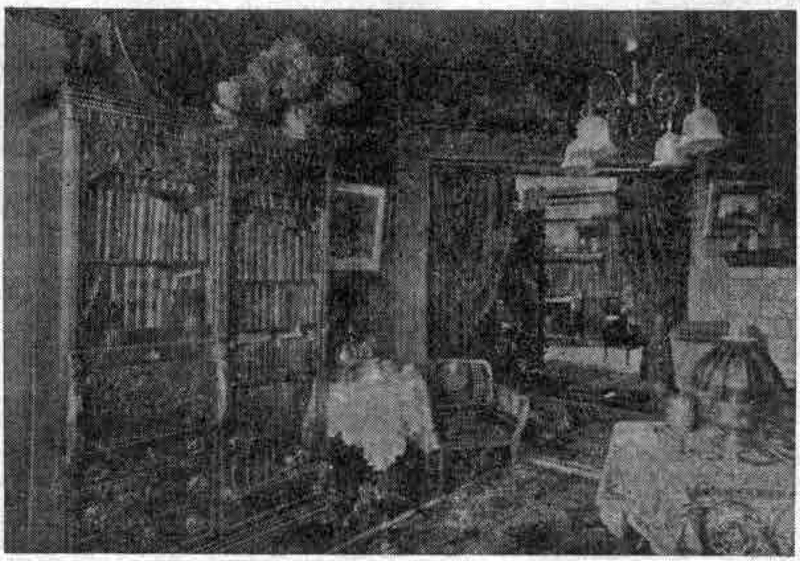 In the October 30 column we showed three pictures of the interiors of one of the first Wayne Estate houses to be occupied, that of the George H. Schultzes, who moved into their home on Walnut avenue in 1888. Since then a profusely illustrated booklet, put out by the Wayne Estate in the early 1890’s has come to us. 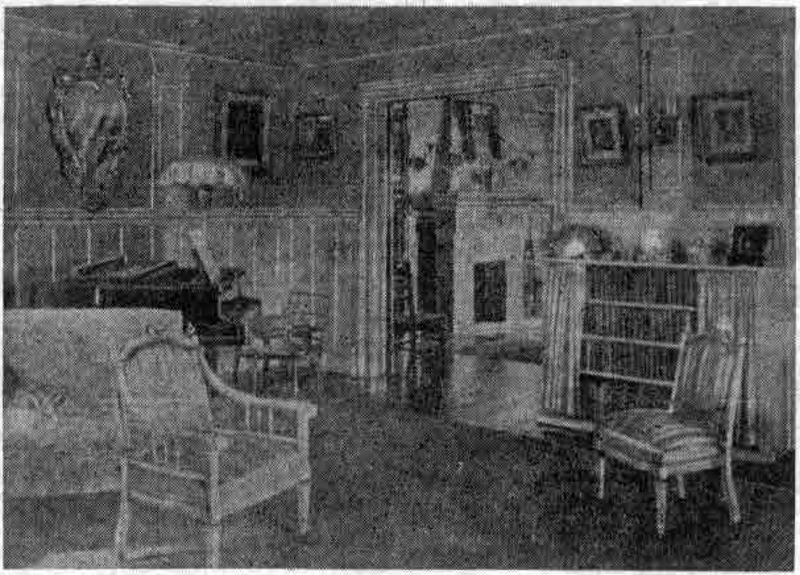 Four remarkably clear photographs of interiors are among the collection of illustrations, three of which appear today. Since the houses in which they were located are not named in the booklet, it might be interesting to find out whether they can be identified by our readers. Of these illustrations and the many others in the booklet, the writer of it has said, “The pictures scattered through these pages are bits here and there, of the Wayne of today (1892), after five years of intelligent and systematic development. They give glimpses of the home-life as seen amidst the flowers and vines which enhance the beauty of the already picturesque houses. The interiors are cozy and home-like, and appeal to all that is best in man’s nature, for truly no more fitting surroundings could be found for the modern household… the interior views afford some idea of the coziness and comfort of the plans which give so much satisfaction to the happy possessors”. The flowery description of these Wayne Estate houses has already been noted in this column. This particular brochure abounds in such descriptions, each, however, with a ring of sincerity on the part of the writer. “Our dwellings, to be pleasant to us”, he says, “must not only express creature comforts, but be a part of our lives – the better part. Home, to be home, should have comfort and individuality in detail”. On another page, a quotation from Ruskin is employed to describe certain ideals of those who planned and built these houses of more than 60 years ago. “I would have our ordinary dwelling-houses built to last and built to be lively, as rich and full of pleasantness as may be, within and without, as such might best suit and express each man’s character and occupation and in part, his history”. Colonel George E. Waring, Jr., is quoted as saying of the community in general, “There are no manufactories; there is no business, beyond the few retail stores required by the population; no liquor is sold in the place, and the conditions of the sale of property are such as to prevent nuisances of any sort. The houses are of good architectural effect, the lots are large, and it is not too much to say that Wayne is, on the whole, the prettiest and best-regulated suburban town of which I have any knowledge”. Wayne then, as now, must indeed have been a pleasant place in which to live! The two pictures used to illustrate today’s column show Wayne’s business block as it looked in the early nineties. Since that time, business has spread out in four directions from the intersection of Lancaster pike and North and South Wayne avenues, the real center of Wayne. With all this increase in the number of business houses and shops over the years the term “business block” is still used to designate only this one section, the block on the south side of Lancaster pike, bounded on the east by Louella avenue and on the west by South Wayne avenue. 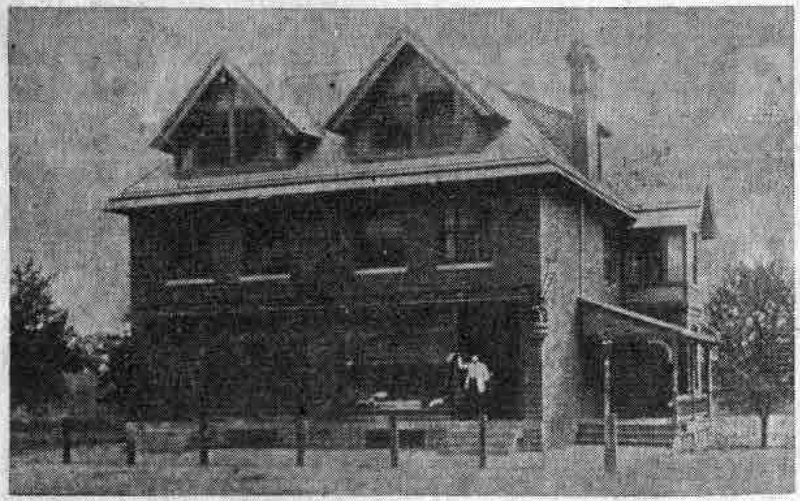 The fist picture shows the building which originally stood on the southeast corner of the Pike and South Wayne avenue, the present site of the Sun Ray Drug Store. It was a double-house building, with space downstairs for two stores and a room over each of these stores for living quarters. At first only the corner store was occupied. When J.M. Fronefield, Jr., first came to Wayne in 1880 to establish a small country drug store, he located in the eastern end of the “Opera House”, now the Colonial Building. By 1893 he had moved into new quarters across the street, having purchased the building now shown in today’s picture. His family lived upstairs, where the present Joe Fronefield, of real estate fame, tells us he was born. Shortly after that his family moved to the large house on West Lancaster avenue now occupied by the Wayne Beauty Salon. In looking at this old picture with Joe Fronefield earlier in the week, your columnist learned many interesting facts about this early business corner of Wayne. 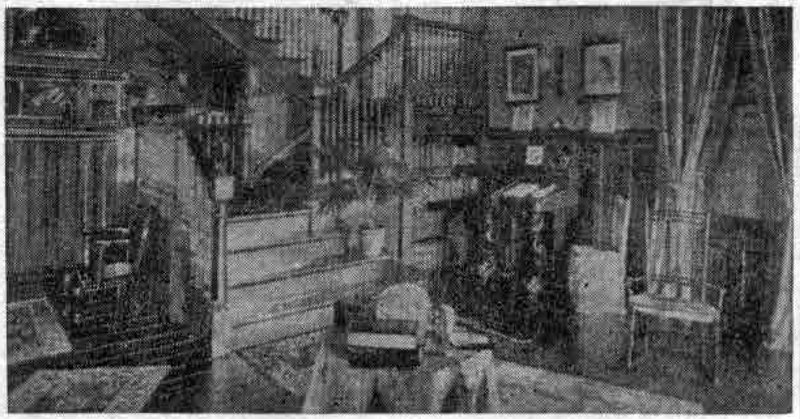 The porch shown to the right was used by the Fronefields for family purposes as long as they lived there. After they moved west on the pike the porch was enclosed, making a small barber shop. At one time Philip DeMarse, who still operates in the Theatre Building, had his shop there. Back of the barber shop was Irving Leighton, a “Merchant Tailor” of the nineties who advertised in the “Wayne Directory and Blue Book” as making a specialty of “Custom and Ladies’ Work”. To the south of the Leighton’s place and in a separate building was Bob McCaig’s shoe repair shop. Back of this shop was a small stable, which was converted into Wayne’s first Chinese laundry. 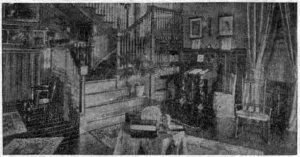 The figure standing in the doorway in today’s picture is J.M. Fronefield, in his apothecary’s white coat. With a magnifying glass the reader can see the mortar and pestle of his trade on a sign at the right of the building. In front of the store are two objects of interest which have now outgrown their usefulness – an oil street lamp and a hitching post rail, which, according to one historian of the time, had “enough ties on it to accommodate any number of buggies”. Those were the days when “the narrow roadway that was the pike was all that the horse and wagon traffic demanded” and “buyers in Wayne shopped in comfort beneath ample shade trees”. Only the eastern end of the original corner building now remains. Under new management, the bakery in operation there still retains the old Lienhardt name. 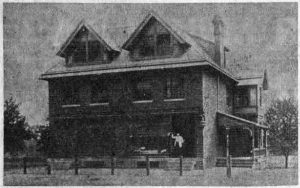 “The former porch has been converted into the “Country Cousin” shop and the jewelry store operated by George K. Weaver. The Lienhardts’ side yard was sold to the Harrisons for the site of their present store. In 1910, Mr. Fronefield sold his business to Harry LaDow, who in turn sold it to Claude LaDow. The store later passed from Mr. LaDow’s ownership to that of Media Drug Store. Then the Media chain sold out to Sun Ray Drug Company, which now operates one of its many stores there. Joe Fronefield recalls to your columnist’s memory the interesting fact that the present store was built around the old one while Mr. LaDow still conducted his business in the latter place. After the outer shell of the new building was completed, the old store was demolished. The stores on the rest of the block which are shown in our second picture as they originally appeared, will be described in a later column in this series. Suffice it today to call attention to the small curb sign at the right of the picture, which with the help of a magnifying glass may be deciphered as reading “Christmas Trees for Sale”. This picture must have been taken some 60 years or more ago at this season of the year. Advertisements in Directory and Blue Book issued by Wayne Title & Trust Co. Fully as interesting as the old times pictures which we have recently used in this column are some of the local advertisements of more than 50 years ago. The first one shown in today’s column is reproduced from the Directory and Blue Book issued by the Wayne Title and Trust Company in 1899, while the second is from a similar directory printed five years later. Lorgnettes, used so seldom nowadays as to be almost a curiosity, were in common use in the late 1800’s and early 1900’s. Frequently the lady who raised them to her eyes would have seen more of the world about her, as well as of the printed page before her, had she frankly put on her spectacles. However, it is not to be denied that there is a certain charm and elegance about the lorgnette, shown in the slim hand of the lady with a wide lace ruffle around her slender wrist! The advertisement of Bonschur and Holmes, “Spectacle and Eyeglass Makers,” located in 1899 at 1533 Chestnut street in Philadelphia, was doubtless placed in the directory by the late Arthur L. Holmes, who was then a resident of Wayne. 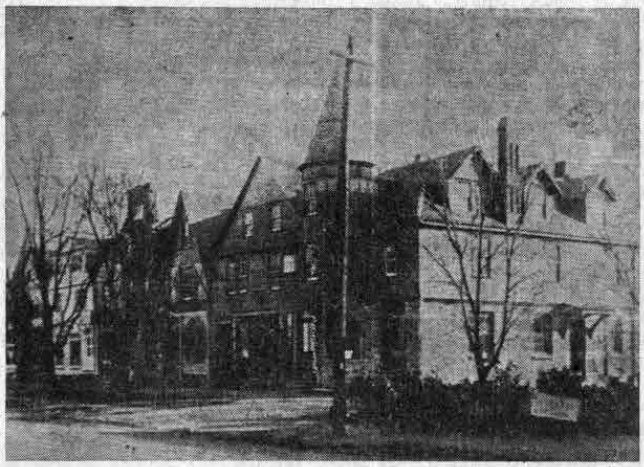 With his family he occupied at that time one of the Wayne Estate houses on Summit avenue (now South Wayne avenue) just opposite the point at which Audubon avenue goes off in a westerly direction. Although Mr. Holmes died some years ago, the house remained in the estate until rather recently. 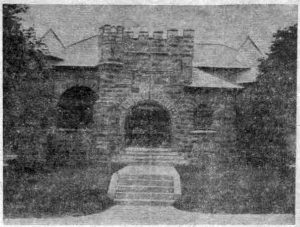 It is now occupied by Dr. and Mrs. Richard Cathcart, newcomers to Wayne. 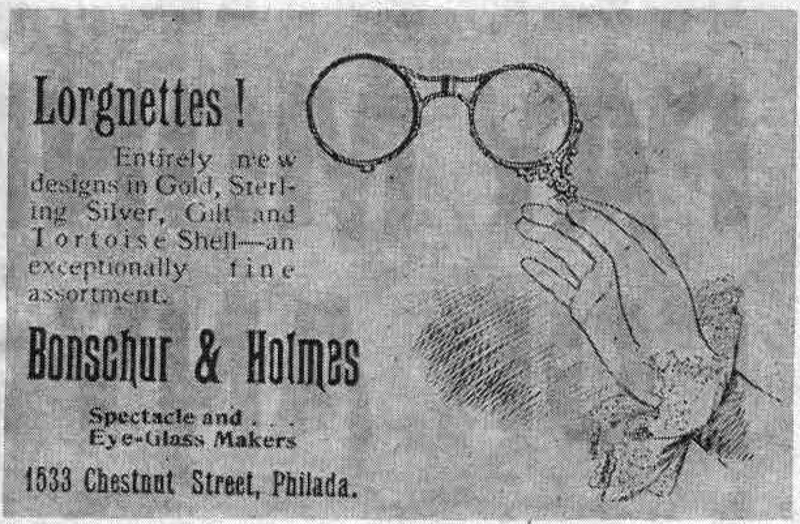 Under the old firm name of Bonschur and Holmes, the optical shop continues to operate in Philadelphia, although the present location is now 1900 Chestnut street. The second advertisement features a picture of something far more outmoded than the lorgnette – an old time buggy, a “light carriage for two persons, usually with a folding top.” The wheels of the buggy in the illustration were evidently steel-rimmed, rather than rubber tired, as were those of a somewhat later date. 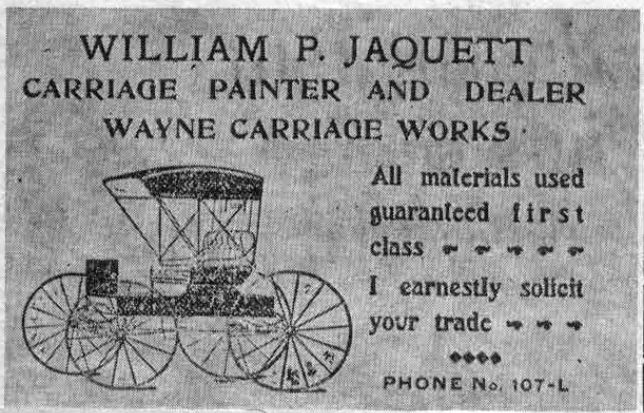 Mr. Jaquett, “Carriage Painter and Dealer, Wayne Carriage Works,” lived in 1904 on West Beech Tree Lane. Ackers, located at 121-125 North 8th street, as well as on Market street below 12th, offered “Choicest food products of the World” to “all residents of Wayne.” Orders for this suburb were “regularly called for and delivered,” while “Ackers Weekly” was mailed free of charge. E.A. Bowker, located at 13th and Market streets, with a branch store at 40th and Market, specialized in coffee “made from Vienna Blend.” This “delicious stimulating beverage” sold for 25 cents a pound, four pounds for one dollar! Salesmen would call on customers and deliveries were made in Wayne and St. Davids every Wednesday, according to their advertisement. Two rare treasures, in the way of lists of names and addresses of people who lived in this vicinity at the turn of the century, have recently been lent to your columnist by Miss Beatrice Tees and her brother, De Bourg Trees, of Lancaster avenue, St. Davids. These are an 1899 “Directory and Blue Book of Wayne and St. Davids,” and a similar book for 1904. Not only do these contain names and addresses of the residents, but they list, as well, the various stores and businesses that were located here then. And since the files of “The Suburban” were destroyed by fire in 1906, no such information as that given in the two directories has been available to your columnist before. It is interesting to note that the first name listed under “T” is that of Dr. Ambler Tees, who lived on “Lancaster, W. Of Pembroke, s.s.,” which, in less abbreviated form, means that he lived on the south side of Lancaster avenue. Dr. Tees was the father of the present occupants of this same house, Beatrice and De Bourg Tees. The former tells us that this home, one of the early Wayne Estate houses, was purchased by her grandfather in 1890, while it was still under construction. He intended to use it as a summer home only, the same purpose which a number of Philadelphians of that period had in mind when they came to Wayne in the late eighties and early nineties. 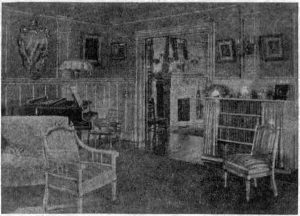 However, the original purchaser died before he ever occupied the house, and so his son, Dr. Ambler Tees, came there to live, bringing his young bride. And here their two children, the present occupants of the house were born. Both directories were published with “Compliments of the Wayne Title and Trust Co.” The picture reproduced in this week’s column is a copy of the one in the front of the first booklet and shows the original bank building as many old timers still remember it – a small building with a charm all its own. Although on the same plot of ground now occupied by the modern and much larger structure, it faced on South Wayne avenue (then Audubon avenue) with West Wayne avenue running to the left of it and Lancaster Pike to the right of it as indicated in the picture. One set of stone steps led to the small yard which surrounds the building, while another linked to the wide doors, which somehow give an appearance of more informal hospitality than do most bank entrances. Directly in back of the triangular piece of ground on which the bank was located was the property running from the pike to West Wayne avenue, occupied then as now by the Central Baptist Church. The original small library stood on the same site as does the greatly enlarged one of the present. All of this is very clear in the large map which folds up neatly in the front of the directory. Also shown is the Saturday Clubhouse, which had just been completed the year in which the map was drawn. Officers were Louis H. Watt, president; Harry C. Hunter, secretary and treasurer, and Christopher Fallon, solicitor and title officer. Directors included such well known men of the late nineties as Dallas Sanders, William West, Julius A. Bailey, Fred F. Hallowell, John H. Watt, Joseph W. Thomas, Tryon Lewis, Fred H. Treat and James Goodwin. After puzzling in vain over such a lake as “Edgewood” in this vicinity, your columnist unfolded the map in the front of the directory, only to find that it was later known as the Walton Pond, enjoyed by many in later years for the swimming and skating facilities which it offered. Much of the acreage offered for sale by the Wayne Title and Trust Company was bought by Charles Walton for his family home, “Walmarthon,” now the property of the Eastern Baptist College.